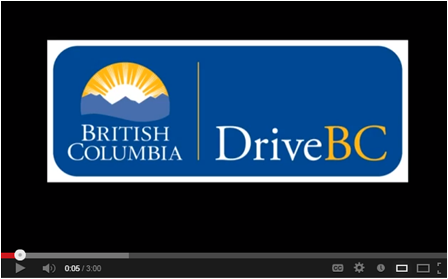 How well do you know DriveBC? You’re looking out the window. It’s cold and miserable out there, and the rain is pouring down. Over the radio, you hear a storm is on the way. There may even be snow at higher elevations. You start to wonder if this weather’s going to affect your drive to the Interior later today. You were thinking of heading up over the Coquihalla, but maybe a different route would be better. Time to check DriveBC. To make good decisions on where and when to travel, real-time highway information is essential. Between checking the current road conditions and events, having a look at your route with the webcams and talking directly with DriveBC staff on Twitter, you get the information you need when you need it. But have you ever wondered what it takes to make the system work? Or how much information it’s actually providing? If so, you’ll want to have a look at this video we put together. 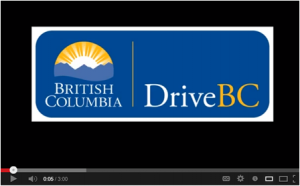 It walks you through some of DriveBC’s more popular features, but it also gives you a bit of a glimpse behind the scenes to show you how DriveBC is evolving and how it’s helping travellers know before they go.